Produced by sustainability-minded investment firms Bonterra Partners and SLM Partners in collaboration with Stone Barns, the report is the first deep dive into consumer demand for grassfed beef and the economics of its production. 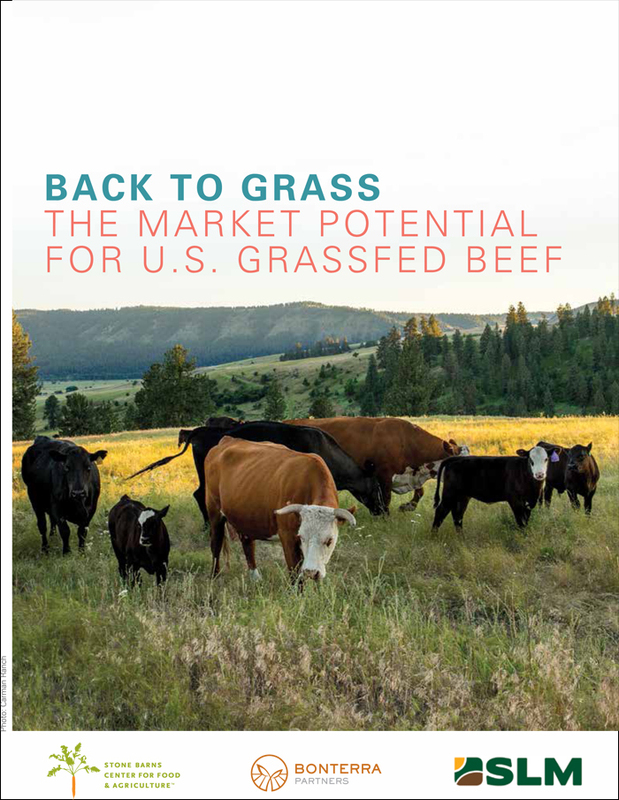 And the news is good: according to “Back to Grass,” despite major obstacles, there is serious potential to grow grassfed systems to a size that could compete with the grain-fed feedlot system that currently produces the vast majority of U.S. beef. While the production of meat under the feedlot system causes major environmental issues, including methane emissions, intensive resource use, and soil and water pollution, regenerative grassfed systems have been shown to restore soil health and sequester carbon, while prioritizing animal welfare and producing meat that’s better for human health. But big questions remain: Can production challenges be met while maintaining the integrity of the regenerative approach and of the term grassfed? Can the industry effectively educate consumers on what labels really mean? And can grassfed proponents convince people that grassfed beef is not overwhelmingly lean and dry, as commonly believed, when produced properly? In some ways, consumers are actually leading the charge, according to the report, as overall demand has shifted toward natural and organic foods produced with greater concern for health, animal welfare, and sustainability. On a panel on consumer trends, Maple Hill Creamery owner Tim Joseph said research his company conducted showed that consumers often thought their organic meat came from cows grazing only on grass, and once they learned that organically raised cows can still eat a diet of corn and soy, they were often driven to buy grassfed instead. “The grassfed system lines up with the customers’ aspirational vision of what they thought was happening on farms,” Joseph said. “I think we’re at a tipping point,” said Urvashi Rangan, a sustainable food systems consultant who’s been working with leaders in the industry to develop a consensus around grassfed labeling. Rangan compared the current status of grassfed to where organic was 20 years ago, when the market had not yet developed to begin to meet consumer demand for healthier foods. And she pointed out that interest in grassfed beef has grown despite the widespread belief that it does not taste as good as conventional beef, plus confusion as to what grassfed really means and which labels can be trusted. “Consumers are interested in purchasing sustainable meat, and they’re interested in the grassfed market, but they really don’t know how their meat has been produced,” said Stone Barns CEO Jill Isenbarger. “It illuminated for me the need for a more consistent certification standard and simpler, clearer communication that’s truly transparent to consumers,” she added. Though consumer demand is high, the way it is currently being met is problematic for many American farmers. Between 1998 and 2016, the number of grassfed beef finishers in the U.S. grew from 100 to 3,900, though they still represent a tiny amount compared to the overall market. Additionally, 75 to 85 percent of the grassfed beef sold in the U.S. is imported from countries including Australia, New Zealand, and Uruguay. Thanks to climates that allow for year-round grazing and much more developed grassfed systems, those countries’ products often sell at a lower price. And, since Congress rescinded the country of origin labeling (COOL) requirement last year, foreign-produced meat may also be labeled “Product of USA” when it passes through a USDA-inspected plant. Experts say much of the grassfed beef being sold at a larger scale—like ButcherBox’s mail-order subscription boxes or Hardee’s and Carl’s Jr’s grassfed burgers—consists of imported meat. Another major challenge to growing the grassfed market in the U.S. is an inefficient supply chain that leads to customers paying up to a 70 percent premium, while very little of that money makes its way back to the farmer. In a survey of producers detailed in the report, the biggest challenge cited was a shortage of processers. The proliferation of the feedlot system led to the shuttering of many small slaughterhouses over the past 40 years, and small farmers often don’t have access to large slaughterhouses or have to pay huge markups, since they’re not processing as many animals. For those not selling directly to consumers, there is also no streamlined distribution system for their meat compared to conventional beef production. Producers typically sell to branded meat programs, which adds an extra step to the process, and leads to higher costs. The report presents an “aspirational scenario” that solves for many of these issues, and co-author Paul McMahon of SLM Partners said he knows of producers already raising capital to put it into action. 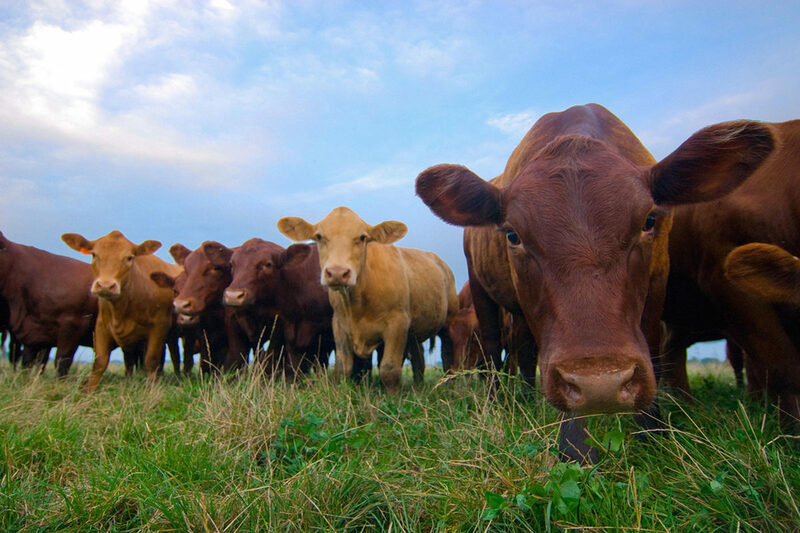 Currently, there are very few U.S. grassfed farms finishing more than 5,000 animals per year. If that number were doubled to 10,000, it would allow the farmer to start to benefit from economies of scale, meaning higher margins for producers and a drop in the price premium from 70 to 22 percent. (Large CAFOs are defined as operations with more than 1,000 cattle, for comparison.) “It is at this point that grassfed beef might start to displace conventional feedlot beef in a significant way and move from a niche to the mainstream,” the report reads. And on what grassland would these thousands of cows roam and ruminate? The “Back to Grass” report broke down the feasibility of replacing all grain-finished beef currently produced in feedlots with grassfed systems and found there is more than enough land available, thanks to 17.6 million acres used to grow grain for feedlots, idle grasslands, and land in USDA conservation programs. “Could we raise all of the animals in the U.S. now on grass? Technically, the answer is yes,” McMahon said. He also discussed smaller next steps that could bring down land costs, such as diversifying current grain farms to graze cattle on cover crops seasonally, which would produce grain and beef on the same amount of land while protecting the soil and sequestering carbon. Isenbarger pointed to collective models that have worked in other industries—like Organic Valley in dairy—as a model that may work well to move grassfed beef forward, too. “If smaller producers can come together on some of those issues … to do their processing, distribution, and marketing together, it feels to me like there’s more possibility to think about being more competitive,” she said. Companies like Happy Valley Meat and Big Picture Beef are currently working on versions of that model. Of course, many of the scenarios presented in the report are theoretical, and the challenges to upending an agriculture system based entirely on growing corn and soy to churn out cheap feedlot grain-fed beef are more than a little meaty. “One of the other things the report made clear for me is the complexity,” Isenbarger admitted. Instead, they present their work as an argument detailing ways in which the many challenges might be met gradually, to slowly transform the American landscape back to grazed grassland, for the sake of farmers, animals, eaters, and the planet. In the end, it’s a scenario that will require policy changes and an incredible amount of investment and infrastructure development. We are in East TN and have a processing (not slaughtering) facility USDA inspected and lots of grass-fed beef. We have been trying to get our grass-fed ground to the market place for 6 months, and struggle with having outlets to get our product to. The large chains have their partnerships and are unwilling to diversify, that should be discussed in your article. The corporations are still squeezing out the little guy.